Kill Your IT Certification Exams With CertKiller! Passing IT Certification exams has never been easier! Exam preparation materials from CertKiller GUARANTEE your success! Real Exam Questions ONLY: straight from current certification exams. Success & Money Back Guarantee: we have an amazing 99.6% pass rate history among our customers, so you either pass or get your money back! Flexible Testing Engine: customize your practice exam to the point of 100% identical simulation of the exam experience. INCLUDED Free Updates, brought to you within 1 week of any certification exam changes. No Waiting Game: enjoy instant downloads and get your files the moment you have paid for them. We Answer Your Questions: 24/7 support and IT Expert Trainers are always there for you. 100% Secure Shopping Experience Your personal information is fully secured and will never be shared with anyone. Planning to take a lot of exams? So why pay for each if you can just pay once for all the exams – and SAVE? 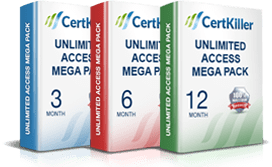 CertKiller Unlimited Access Megapack is a perfect option for candidates planning to pursue more than one certification. With Unlimited Access Mega Pack, you can study for multiple certifications by downloading Questions & Answers for all your exams. CertKiller Unlimited Access Megapack comes in convenient 3, 6 and 12 months subscriptions and will save you the pain of looking for multiple sets of preparation materials - and paying for each and every one of them. Get them all in bulk! With Unlimited Access Megapack, you get unlimited access to over 1300+ Real Exam Questions from 100+ Vendors. What's so great about CertKiller? Only correct answers verified by reputable industry experts with decades of experience. Regular updates, available as soon as they are implemented on the real exam. Money back guarantee, combined with the industry's highest pass rate: 99.6%! 17 years in the business, with over half a million of successful customers. Instant download, available the moment you have purchased your training materials.